Harrie Fasher from Oberon, NSW was announced as the recipient of the prestigious $50,000 Rio Tinto Sculpture Award, one of the most generous awards for sculpture in the world, for her abstract steel work ‘Transition (2016)’. The sculpture, of a horse rising out of the sand on Cottesloe beach, depicts an Icelandic myth of a horse travelling between worlds. Fasher was presented with the $50,000 acquisitive award by Chris Salisbury, chief executive of Rio Tinto’s Iron Ore group, at the opening of the 14th annual Sculpture by the Sea, Cottesloe. The Western Australian Sculptor Scholarship of $10,000 was awarded to Fremantle artist Sally Stoneman for her sculpture ‘Seed’. The scholarship, donated by Gavin Bunning & Julienne Penny since 2013, is to support travel, study and the advancement of the artist’s career. It also includes an invitation to exhibit at Sculpture by the Sea, Bondi. Geoff Overheu from Gingin, WA was awarded The Rio Tinto Sculpture Inside Award of $5,000 for his bronze work ‘Swarm (2017)’ at the opening of ‘Sculpture Inside’, an indoor exhibition of sculpture by exhibiting artists and selected invited artists. Taiwanese artist Tang Wei Hsu was awarded the Andrea Stretton Memorial Invitation of $5,000 to exhibit at Sculpture by the Sea, Bondi 2018 for his work ‘Jade Petals’ at the Artist Opening Party held at the Cottesloe Beach Hotel. Now in its 14th year, the exhibition returns to transform the famous white sands of Cottesloe Beach from 2 – 19 March 2018. One of Perth’s largest free public events, the exhibition attracts an estimated 220,000 visitors. More than 70 Australian and international artists are set to showcase their work across the 18-day exhibition including 28 artists from WA. Acclaimed Israeli artist Zadok Ben-David joins Zhan Wang at Sculpture by the Sea, Cottesloe 2018, exhibiting for the second year in a row after his 2017 work ‘Big Boy (2016)’ captured the imagination of the thousands of visitors to the exhibition and his success at this year’s Perth International Art Festival. Zadok Ben-David and Zhan Wang will be joined by a number of other leading international sculptors, including Danish architect Johan Gjøde whose work at Sculpture by the Sea, Aarhus in Denmark in 2015, ‘The Infinite Bridge,’ became an international hit. The exhibition will showcase works by some of WA’s leading sculptors including Tim Burns, Olga Cironis, Elaine Clocherty, Tony Davis, Kevin Draper, Ron Gomboc, Tony Jones OAM, Janine McAullay Bott, Johannes Pannekoek, as well as leading mid-career and emerging artists Sharyn Egan, Jina Lee, April Pine and Tania Spencer. With 14% of Sculpture by the Sea’s costs covered by government partners and the remainder from private donors and corporate partners, the artists often need support to cover the cost to transport their sculptures to the free exhibition. 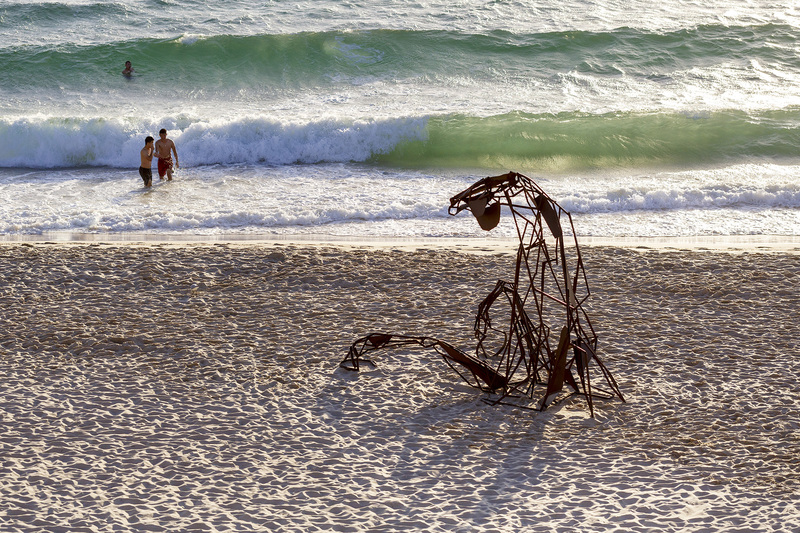 This year, the sculptures have travelled 319, 467 miles to Cottesloe. Sculpture by the Sea is asking visitors to ‘Buy A Mile’ with a $1 donation to directly assist artists, help the artists return next year and keep the exhibition alive and free for the community.